You record a clip and give it a topic, then your friends can add their own clips to your new collaborative video. That's what's behind Facebook's newest app, Riff, announced on April Fool's day but definitely (probably) not a joke. 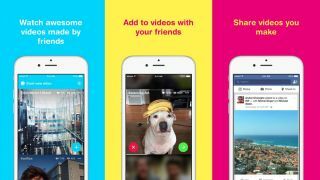 Riff is a collaborative video app that Facebook hopes will inspire ever-widening circles of friends to contribute to lengthy highlight reels that can then be posted to Facebook. Once your friends have added to your original video, their friends can then add to it to, and "the potential pool of creative collaborators can grow exponentially," Facebook says. Riff marks another way an existing tech company is trying to get its users to engage in new methods of sharing, like Twitter's Vine and even HTC's Zoe. We'll see whether it catches on, though, as Riffs also have the potential to become chaotic messes of videos made by a bunch of people you don't even know. Download Facebook Riff on iOS or Android to start making clips to share with friends and check out the videos that your friends have already started working on.